Come and join us on this winter sun holiday to the beautiful North African resort of Agadir. Our 4* All Inclusive hotel is located on the charming Bay of Agadir. With year round sunshine, we can grab a sun lounger and relax and unwind. Our hotel is in a prime location just a short walk from the fine white sands of the beach with its own private area with loungers and umbrellas at our disposal. With a host of facilities and entertainment to keep us occupied or as relaxed as we like with its heated pool and a spa, there is also the option for a short stroll to the lively souk as well as many good bars and restaurants. Agadir is Morocco’s premier and cosmopolitan beach resort. 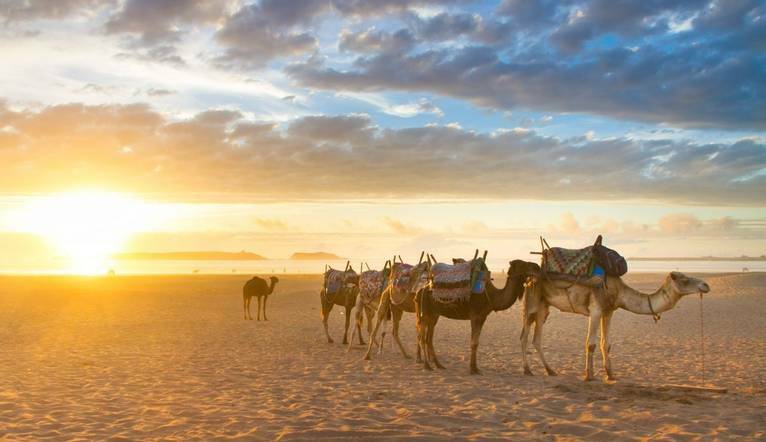 Located along North Africa’s coastline, surrounded by the Sahara Desert, it has 10km of golden sand, and many natural parks all of which are easily accessible. With plenty of beachfront bars, along palm-lined boulevards, we’ll be pretty sure of lazy days in the sun but also of the opportunity of fabulous exploration beyond. A visit to Morocco would not be complete without a trip to the famous markets (bazars). We can haggle for silver or gold, or indulge in the fashionable boutiques for designer clothes and leather goods. Agadir’s the perfect base from which to explore the region, should we choose to. For a truly authentic experience, head to the pink Berber village of Tafraout situated in the heart of the Atlas Mountains travelling through a variety of landscapes long the way. Or why not head into vibey Marrakech with its famous Djemaa El Fna square. Another delight comes in the form of Essaouira town, with its whitewashed medina and mixture of Berber, Carthaginian and Portuguese influences resonating through the architecture and culture. If its’ an oasis you are after, then take a trip to Tiout, one of the largest palm groves and Taroudant, a 1000 year old city. Brand new to Solos, this popular hotel is based in the Bay of Agadir just a few kilometres from the centre and a few minutes walk to the long sandy beach and the wonderful souk. Surrounded by lush gardens and built in the traditional style, extensive facilities here include 2 swimming pools (1 heated), restaurant, bar, snack bar, sun terrace, private beach area (accessible through private underpass), tennis courts, gym, and sports facilities. There is also a spa on site (extra charges may apply) which offers a steam room, hammam, sauna and treatments. Our spacious bedrooms, offer air-conditioning, satellite TV, fridge, safe, hairdryer, complimentary WiFi and balcony or terrace. The transfer from the Airport to the resort is approximately 40 minutes. These are just a few of the tours, which may be available to you depending on the time of year and the numbers interested. Full details of all the excursions available will be advised at the Information Meeting. Prices may vary, depending on numbers etc and are only a guideline. All tours should be paid for in cash in Euros. The exact amount will be given at your Information Meeting. Your Tour Leader will help arrange these for you but may not necessarily accompany you. Sightseeing of this modern town which has been completely destroyed by an earthquake in 1960. Visit of the picturesque port: the Kasbah, with it’s splendid view and the daily bustling souk. Full day sightseeing of this imperial city. Its monuments and its famous djemâa El Fna square with the surrounding souks; Lunch at a typical restaurant ( Round trip of 500 Km). This pink Berber village, surrounded by rocky mountains situated in the heart of the Anti Atlas mountain chain. This round trip of 400Km offers a variety of landscapes dotted with Kasbahs and Berber villages. On the way, visit of Tiznit, famous for its silver craft. Departure to Tiout one of the largest palm groves in the south of Morocco. Donkey ride through the oasis . Lunch after visiting the Kasbah. Sightseeing of Taroudant, a 1.000 year old city surrounded by fortified walls which is the former capital of the fertile souse plain. We suggest a group collection at the end of your holiday to cover drivers, guides, porters and hotel staff (including restaurant, kitchen and reception staff) of approximately £15 (or the equivalent amount in local currency). Your Tour Leader will collect this on your behalf and distribute it accordingly, thus relieving you of the burden of who, when and how much to tip. The tipping of bar staff and housekeeping will be left to your individual discretion (the rounding up of the drinks bill and a small amount left in your room on departure should cover this and would be much appreciated). Very casual attire during the day; long shorts, T-shirts etc. (skimpy shorts and skimpy T-shirts are not appreciated in Morocco). We do recommend however you take some long sleeved shirts and long cotton trousers to cover up from the sun. We suggest smart casual wear for the evenings. Comfortable shoes are a must for sightseeing and we would recommend trainers or comfortable walking shoes if you head into the desert and mountain areas. If you are in the desert or mountains in the evening, the temperature can be considerably lower, and a jumper/jacket would be required.